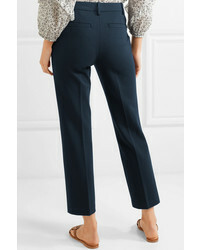 If you're looking for a casual yet absolutely chic outfit, wear a navy blazer and Tory Burch sara jersey straight leg pants. Both items are totally comfy and will look fabulous together. When it comes to shoes, this ensemble is round off wonderfully with white leather oxford shoes. 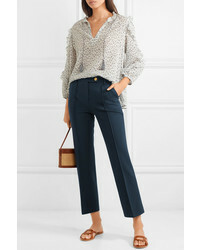 For a knockout-meets-totally stylish getup, make a beige trenchcoat and Tory Burch sara jersey straight leg pants from NET-A-PORTER.COM your outfit choice — these two items play nicely together. When it comes to footwear, this getup is complemented nicely with black suede pumps. If you're searching for a casual yet chic getup, pair a white crew-neck t-shirt with Tory Burch sara jersey straight leg pants. Both garments are totally comfy and will look fabulous together. To bring out a sassier side of you, complete your outfit with white leather low top sneakers. For a smart casual ensemble, team a grey trenchcoat with Tory Burch sara jersey straight leg pants — these two pieces go beautifully together. For something more on the daring side to complete this outfit, throw in a pair of red leather high top sneakers. 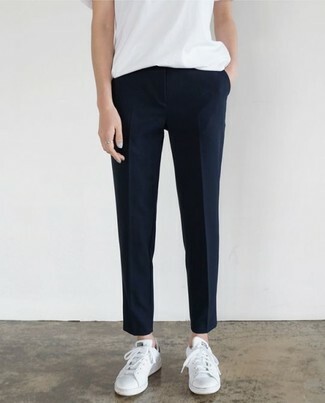 If you're searching for a casual yet totally chic getup, consider pairing a white crew-neck t-shirt with navy dress pants. Both garments are totally comfy and will look fabulous together. Rocking a pair of black leather heeled sandals is a simple way to add some flair to your getup. If you're searching for a casual yet chic look, pair a black leather bomber jacket with Tory Burch sara jersey straight leg pants. Both items are totally comfy and will look fabulous paired together. You could perhaps get a little creative in the shoe department and elevate your getup with black and white leather pumps. 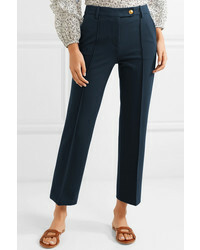 If you're facing a fashion situation where comfort is prized, team a navy blazer with Tory Burch sara jersey straight leg pants from NET-A-PORTER.COM. When it comes to shoes, this look is finished off perfectly with blue suede heeled sandals. For a knockout-meets-totally chic getup, try pairing a beige trenchcoat with Tory Burch sara jersey straight leg pants — these items play really wonderful together. 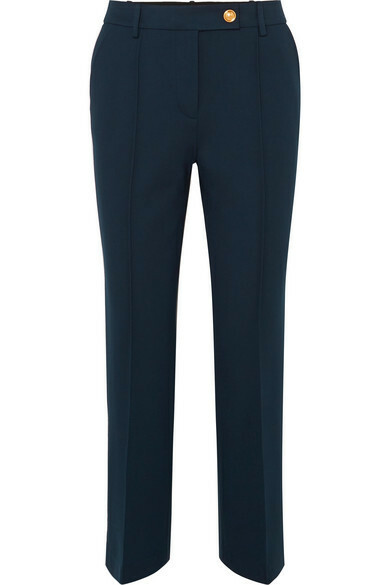 When it comes to shoes, this outfit is round off well with white and black leather platform loafers. For a casually elegant ensemble, opt for a white button down blouse and navy dress pants — these pieces play really good together. Silver leather pumps complement this outfit quite nicely.